Members have to pay an annual member fee of €9 for students of upper primary schools and €15 for students in upper secondary schools. The main source of funds is the Ministry of Education, but funds are granted by many other institutions and foundations – many are project-based. The main source of funds is the membership fee that is €14-16 euros per year. We also get funds from the Ministry of Education. FSS: FSS has 6 members of staff. A secretary general and an organisational secretary work full-time. FSS has four project-based employees, two of which work full time with the FSS event Kulturkarnevalen (“Culture Carnival”) and two who both work part time for a school democracy project. The president is not a member of staff, but he works full time and gets paid for this. SLL: SLL has 11-13 members of staff. 8 employees work full-time in the office. SLL has three to five project-based employees who visit schools. The president and two vice presidents are not members of staff, but they work full time and get paid for this. FSS: The highest decision-making body is the general assembly. The GA convenes yearly. The daily affairs are managed by a board. This board consists of a president, two vice presidents and six to eight board members. 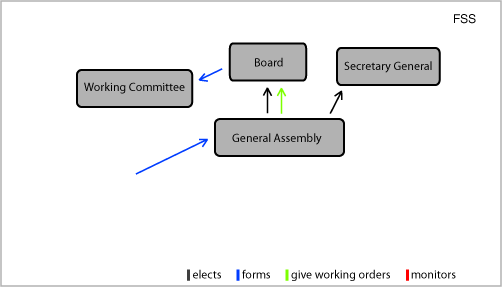 Additionally, FSS has a working committee which prepares matters for the board to discuss and takes care of matters which the board sees fit to pass on to the committee. FSS has two district organisations, one in the capital area of Helsinki – Helsingfors Elevers Centralorganisation HECO (The Central organisation of the students of Helsinki) - and one on the western coast, Pohjanmaa – Pampas Elevdistrikt (The District of Pohjanmaa). 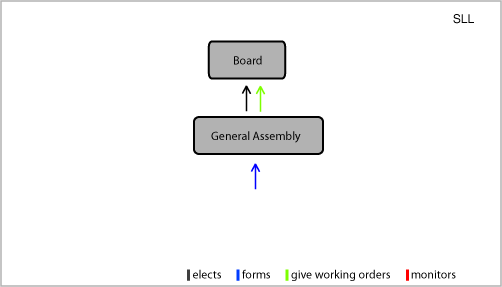 SLL: The highest decision-making body is the General Assembly. The GA convenes yearly. The daily affairs are managed by a board. This board consists of a president, two vice presidents and eight to ten board members. SLL has ten district organisations with their own boards. The presidents of these boards are present during SLL board meetings. According to Finnish law, the students in every secondary school in the country have to form a student body and have a representative organ, a student council. Furthermore, according to Finnish law, the educator is compelled to give the students the opportunity to participate in the development of the education and hear the students before decisions on education, or on other factors that influence or have an effect on the student, are made. The position of student councils in schools varies widely in different region and types of schools. For instance, about 90% of the upper secondary schools have at least formal student councils, but the equivalent percent in vocational schools is only 60. In terms of student actually being heard and having a role in the decision-making in schools, the situation varies from dire to quite good. The main task of municipal youth councils is to provide a channel for young people’s perspectives, wishes and initiatives in local government. Around 50 Finnish municipalities have a youth council. Members of youth councils are selected in elections, with the age limit of those entitled to vote varying from one municipality to another. In most cases local residents aged 13 to 20 have the vote. The status of these councils also varies. They do not have any actual decision-making power in municipal issues. Some municipalities allow youth councillors access to and the right to speak in organs such as the leisure committee. The youth council may also have the right to submit initiatives directly to the municipal council, which is obliged to consider them officially. Youth councils are usually consulted in issues such as the planning of facilities for physical exercise or youth activities. On a national level students are seldom heard, though lately the situation has improved. For instance, the government adopts a development programme every four years with the aim of stepping up cross-sector youth policy action. The programme contains the youth policy objectives for the coming years. The programme is prepared by the Ministry of Education in collaboration with other ministries. The Ministry of Education steers and develops youth policy by means of legislation, studies and reviews and budgetary and lottery funding. The aim is to support young people's active citizenship, empower young people socially and improve young people's living conditions. The national Advisory Council for Youth Affairs (NUORA) monitors the development of young people's living conditions on a regular basis. It assesses the implementation of the youth policy programme, takes initiatives and commissions reviews of young people's living conditions. The annual Youth Barometer surveys young people's attitudes and values, future expectations and opinions of their social influence. Finland has a respectable public system for funding of student unions at a national level; student unions can for instance receive grants that render activity possible. Albeit decision-making in Finland takes place on a quite high level the student organisations are heard, especially on university level. SLL: SLL focuses heavily on research in order to be well informed about the condition of the secondary education system.